A quick note to fellow members and site visitors in Australia. 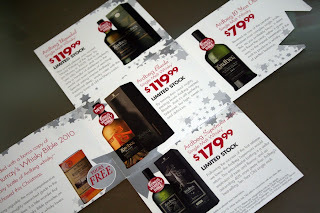 I just received in the post this morning a promotion from Vintage Cellars. Buy any Ardbeg in store or by phone (1300 366 084) and receive a copy of Jim Murray's Whisky Bible 2010 edition. Stocks are limited so be quick as they say. Don't try to find information on the Vintage Cellars website about this promotion as they do not seem co-orniated enough to get it up there though there was an announcement on twitter (not that it is an ambition of mine to subscribe to a Vintage Cellars twitter, seriously if you want people to know about this at least use the website). Stock limitation in NSW can be found at the Bondi Junction, Double Bay, Leichhardt, and Neutral Bay stores. QLD can be found at New Farm, Clayfield, Indooroopilly & Paddington. OK so the Whisky Bible on offer is 1 year out of date but that is still not a bad deal to be had. The current edition is $37.95 AU online from Borders bookshop or even better $19.95 AU (no postage fee) from the Book Depository online. Even though on any day you can pick up Ardbeg 10yo for $69.00 at Dan Murphys, for any of the other releases you really are paying below average pricing if you include The Whisky Bible. Not having a store located near me that is holding stocks (even though The Hills seems to be a bit of a whisky haven) I will be making my purchase on the phone. A great start to Dramcember lads to get ye a wee dram into ya!